Instead, you will find reporting on a British terrorist actually on trial for terrorism. Leading the stories, you will find Fox News as press liaison for al Qaeda in Idlib — Syria — quoting Amnesty supporting al Qaeda, and posting an impressive staged photo of the savage White Helmets. Over 50 ISIS members were eliminated by strikes of the US-led coalition in the outskirt of the town of al-Baghuz al-Fawqani in the Euphrates Valley over the past few days, local sources reported. The airstrikes were a part of the operation of the Syrian Democratic Forces (SDF) and the coalition in the area, which is ongoing despite a formal US statement declaring defeat over ISIS. According to local sources, a notable number of ISIS members is still hiding in a network of caves and underground tunnels in the area. Besides this, ISIS cells within the SDF-held area have recently carried out a series of attacks killing at least 10 SDF members near the town of Diban and in the area of the Omar oil fields, on the eastern bank of the Euphrates. On March 28, General Commander of the SDF Ferhat Abdi Sahin claimed that the group, which includes the Kurdish People’s Protection Units (YPG) and their all-female faction, the Woman’s Protection Units (YPJ), had made a decision to capture the area of Afrin from Turkish forces. “We are preparing and making arrangements in order to liberate Afrin … Because this is a military matter, everyone should know that when the time is suitable, the liberation phase will begin,” he said in an interview with Sterk TV. Currently, the SDF has no land route to Afrin from northeastern Syria while YPG and YPJ control only a few positions to south and southeast of the area. Therefore, SDF statements regarding the military advance on Afrin should are just a political move designed in an attempt to buy support of the Syrian population. The group, which deeply relies on the foreign support to control northeastern Syria, is currently facing notable problems with the control over the Arab-populated areas seized from ISIS. While the SDF has no real chances to capture Afrin itself, YPG and YPJ cells conduct attacks on Turkey-led forces on a regular basis. On March 31, a Turkish service member was killed and one was injured an attack by Kurdish rebels, according to Turkey’s Ministry of National Defense. Following the announcement, the Turkish military artillery fired more than 100 shells at YPG positions in the towns of Tatmrsh and Shuargha. No casualties as a result of the shelling were reported. The US-led coalition and its proxies from the so-called Revolutionary Commando Army continue to prevent evacuation of civilians from the Rukban refugee camp. They even held a live-fire drill involving High Mobility Artillery Rocket Systems near the US garrison of al-Tanf located in the same area. The situation in the Idlib de-escalation zone remains unchanged. The ceasefire regime is violated almost on a daily basis. Firefights and artillery dues are especially intense in northern Hama and southern Idlib. 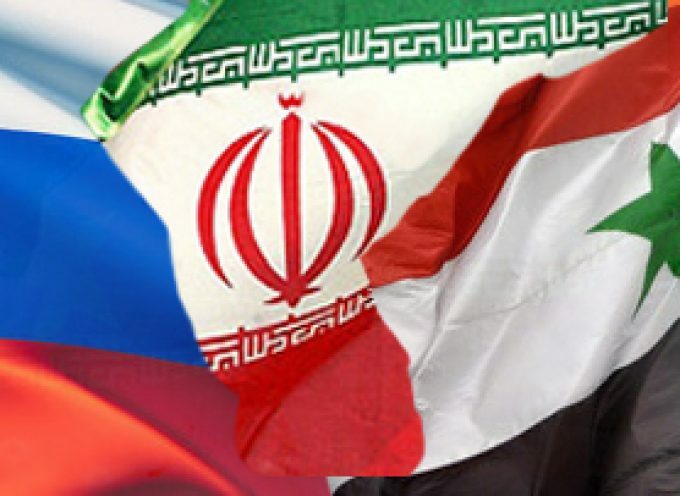 Where are the Iranian and Russian troops in northwest Syria? It’s that time again. Jihadist forces have pushed Damascus’ and Moscow’s patience for too long. These constant provocations have gone too far and it’s time to punish them for their insolence. Damascus and Moscow are gearing up to deal with those damned terrorists again as the Russian Air Force has been flying sorties over the Idlib province, with Ankara’s approval. The Syrian Army’s Russian trained 5th corps, the 4th armoured division and the legendary Tiger Forces have all amassed near the Idlib-Hama border this past week. Something is definitely brewing up. The so called Demilitarized zone has failed as the terrorist forces of Hayat Tahrir Al-Sham (HTS) have taken over all the positions from the other “rebel groups”. As observers may already know, HTS is not included in any reconciliation or ceasefire deal as they are considered to be terrorists by both Moscow and Ankara. Now it remains to see how Washington, the main benefactor of these terrorists, will react. So far they have remained surprisingly quiet over these recent movements by Damascus and Moscow, but I am willing to bet that they will do their utmost to stop this planned offensive. It is of absolute importance that this offensive commences this time and that nothing stops the Syrian Army and their allies, not even Washington’s threats. The Resistance Axis must show no fear in face of Washington’s threats. For how long will Moscow remain patient over the constant threat to the Hmaimeem airport? For how long will these terrorists be allowed to terrorize the Idlib province and its population? It should be noted that this offensive will probably only be limited to the demilitarized zone where the goal will be to clear the area of HTS terrorists. It will be far from a decisive battle that destroys HTS, but it is an important step. The threat to northern Hama and Latakia must be diminished. The offensive will likely also target the crucial town of Jisr Al-Shughour where the Syrian Army in the spring of 2015 bravely fought and held out for over 60 days in the towns hospital before the few survivors managed to evacuate back to Syrian Army lines. The tragedy at Jisr Al-Shughour’s National Hospital will surely not have been forgotten by the SAA. Ankara would do well to realize that if it wants to save the Idlib deal it must accept that HTS must be dealt with, otherwise this deal is a failure and Syria and her allies should explore the option of widening the offensive to cover all of West Aleppo and southern Idlib. These next few weeks will tell us more on how this situation will develop. May God be with the heroic Syrian Army. TEHRAN (FNA)– The Russian and Syrian air force units heavily pounded the militants’ positions in Northern Hama and Southern Idlib in response to the offensives of Tahrir al-Sham al-Hay’at (the Levant Liberation Board or the Al-Nusra Front) in the demilitarized zone. “The Russian and Syrian fighter jets launched airstrikes against the terrorists’ hideouts in al-Tamane’ah, al-Nayrab, Saraqib, Kafr Amim and Ma’arat Hormat in Southern and Eastern Idlib as well as their positions in Northern and Northwestern Hama,” the Arabic-language al-Watan newspaper reported on Thursday. Tens of terrorists were killed and dozens more were injured during the Syrian army’s operations in several provinces across Syria. The Syrian and Russian air force units heavily pounded the militants’ positions in Northern Hama and Southern Idlib in response to the offensives of Tahrir al-Sham al-Hay’at in the demilitarized zone. The Arabic-language al-Watan newspaper reported on Thursday that the Russian and Syrian fighter jets launched airstrikes against the terrorists’ hideouts in al-Tamane’ah, al-Nayrab, Saraqib, Kafr Amim and Ma’arat Hormat in Southern and Eastern Idlib as well as their positions in Northern and Northwestern Hama. Field sources described the Wednesday attacks as the heaviest airstrikes by the Russian and Syrian air force units since September, saying that a large number of terrorists were killed and wounded in the offensive. Concurrent with the airstrikes, the Syrian army forces warded off the terrorists’ attacks from Kafr Naboudeh, al-Sakhar and Murak against the military points. They also targeted the militants’ moves from the towns of Ma’arat, Hormat al-Khowin, al-Zarzour and al-Tamane’ah towards the military points in Southeastern Idlib with heavy missile attacks, leaving heavy damage on them. The Syrian army units in response to the terrorists’ attacks on safe regions in Aleppo and Lattakia, launched strikes against their positions in al-Khalsah, al-Hamirah in Southern Aleppo and regions near Jisr al-Shaqour and Lattakia mountains. The Russian Defense Ministry said in a statement that the Russian Aerospace Force has destroyed a weapons depot belonging to the Tahrir al-Sham al-Hay’at terror group in the Syrian province of Idlib. A pinpoint airstrike was carried out on Wednesday in coordination with Turkey. The air raid “targeted a weapons depot belonging to the Tahrir al-Sham al-Hay’at terror group in the city of Idlib,” the defense ministry added. “According to information confirmed through several channels, militants earlier brought a large number of combat unmanned aerial vehicles to the facility, which they planned to use for attacks on Russia’s Hmeimim air base,” the statement read. The Syrian army found a large number of weapons and military equipment, including Israeli-made arms, during purging operations in regions liberated from the terrorists in the Northern parts of Dara’a province. The engineering units of the Syrian army discovered the military equipment and ammunitions in the towns of Ankhal and al-Hareh in Northern Dara’a on Thursday. A military source said that the Syrian army found different types of assault rifles, machine-guns, RPGs, cannons, anti-tank missiles, grenades, night-vision systems and different types of communication systems, adding that a number of them were made in Israel. Several Kurdish militants were killed in the popular forces’ attacks on a convoy of the US and Syrian Democratic Forces (SDF) in Raqqa. The Arabic-language website of Sputnik reported on Wednesday that the popular forces in Raqqa detonated a bomb on the way of a joint convoy of the US and SDF forces in al-Haramiyeh district in Raqqa city. It added that the blast occurred as the US forces and the intelligence units of the SDF have planted over 600 cameras in the streets and districts of Raqqa. Meantime, the Arabic-language al-Baladi website reported that during the attack, 3 Kurdish forces were killed and 8 others were wounded, adding that the SDF has put its forces on alert. Popular protests against the deployment of occupying American forces and the US-backed SDF in Raqqa have increased recently. The Syrian Arab Army (SAA) has begun its final preparations to launch a large-scale military operation around the northern governorate of Idlib, which is controlled by several radical groups, the Syrian news outlet Muraselon reportedon March 3, citing a military source. “The terrorist groups crossed the line recently by killing many civilians, injuring others and causing severe damage in the infrastructure … This is a clear violation of the Sochi agreement [between Russia and Turkey],” the source told Muraselon. According to the source, the operation will be aimed at capturing the militants’ positions inside the demoralized zone around Idlib. This mean that the operation could cover northern Lattakia, northern Hama, southern Idlib and western Aleppo. Few hours after this report, Syrian opposition activists said that the remaining civilians within the demoralized zone received messaged from the SAA asking them to leave the zone immediately. “You are in a special operation area, leave the area immediately,” the SAA’s message reads. In the last two months, the SAA massed large forces around the demoralized zone. However, many sources said that the army was just reinforcing its positions there. The claims about a nearing military operation around Idlib came few hours after the attack by al-Qaeda-affiliated group, Ansar al-Tawhid, on the SAA positions in northern Hama. More than 16 Syrian service members were reportedly killed in the attack. Turk psychopath, Recep Tayyip Erdoghan, has verbally attacked China for its aggressive policies towards that country’s Uigher population. Turk Foreign Ministry spokesman, Hami Aksoy called China’s treatment of the Uighers: “a great shame for humanity.” Ankara also accused Beijing of killing the Uigher poet, Abdurrahim Heyit, while he was in state custody. Words such as “genocide” have been bandied about in several Turk tirades over the treatment of ethnic Turks living in Xinjiang Province in the West of China. Accusations, largely not denied by the Chinese, have included “concentration camps”, “indoctrination camps” and “forcible measures”. The Chinese have responded to the charges with arguments going to “controlling terrorism” and tamping down militancy, the same issues with which Turkey has to deal in its never-ending propaganda war against the PKK. And without saying so, the Chinese pointed indirectly at Turkey’s criminal support of terrorists in both Syria and Iraq. Let’s not forget that ISIS descended upon Mosul from Turkey. Your editor is always amused by open hypocrisy. Erdoghan, who has promoted militant Islamism in Syria; given haven to some of the world’s most prolific decapitationists; armed and fed whole hoards of crypto-retardates from the Arab World’s cesspools of Saudi Arabia, Qatar and the UAE, is now pointing fingers at a country which is also, like Syria, locked in a battle to the death with radical, global Islamism. I am laughing as I write this post. The so-called poet, Heyit, was shown to be alive by Chinese state media 2 days ago, thus, kiboshing Turkish blowhard Erdoghan’s erroneous claim that he was dead. The physical appearance of Uighers resembles those of Mongol tribesmen. Al-Khuwayn Town: On February 12, 2019, the SAA repelled another boring attempt to infiltrate its lines in Southeast Idlib as the terrorists of Nusra received a complete drubbing by drones, artillery and snipers. According to Wael, the number of rodents confirmed killed was 3 with scores injured. Al-Janaabira Town: Also on February 12, the SAA confirmed the destruction of a row of fortifications after grubs from Kataa`ib Al-‘Izza attacked an SAA position with machine guns in South Hama Province. The terrorists reportedly performed some peekaboo maneuver trying to persuade the Syrian troops into moving out of their defensive positions, but, to no avail. We have no detailed information about rodent casualties although trucks used to carry the dead and wounded were spotted in the aftermath of the fighting. Khaan Shaykhoon: On February 15, 2019, the SAA annihilated 4 HQs of Nusra (HTS) along with a row of revetments along the eastern side of the Ghaab Valley, Syria’s Bekaa, near the towns of Al-Huwayzand Al-Huwayja. Spotters reported 4 rodents killed with many wounded. More fighting was reported in Waadi Al-Dawraat east of Al-Lataamina; at Al-Sukayk east of Khaan Shaykhoon; Al-Tuwayna where the SAA deployed Katyusha rockets to obliterate an entire nest of rodents belonging to the Al-Hizb Al-Turkistaani. It appears that Russia is still trying to get Erdoghan on board. He won’t budge and won’t be seen attacking his fellow Islamist murderers. Dayr Qaaq: The young men in the photo saluted the Syrian Army’s special operations tactical group for their release from the grip of the noisome filth of Nusra. They were hostages of Abu Muhammad Al-Jawlaani and his Turk enablers. The operation took place near Al-Baab where these young men, who refused to serve in any terrorist group, were tortured and brainwashed for months. According to Monzer, they all begged for the opportunity to exact revenge by enlisting in the Syrian Army. Filed under: Al Qaeda, Arab Zionists, Erdogan, GCC, ISIL, Nusra Front, SAA, Syria, Takfiris, Turkey, War on Syria | Tagged: Hama, Idlib |	Comments Off on TURK BIGOTS CONTINUE TO SUPPLY TERRORISTS WHILE DEMANDING JUSTICE FOR UIGHERS IN CHINA; WAR OF ATTRITION IN NORTH HAMA; SAA FREES DOZENS OF HOSTAGES IN E. ALEPPO PROV. بات واضحاً أن عملية تحرير ادلب ستكون العمل الميداني الاستراتيجي الأخير بهذا الحجم وبتلك التداعيات، وأن إنجاز هذه العملية بنجاح على يد القوات العربية السورية وحلفائها يعني وضع حدّ نهائي للحرب العدوانية على سورية التي تجاوزت السنين السبع ببضعة أشهر. ولأن لعملية تحرير ادلب هذه الأهمية والخصوصية التي تتجاوز كل ما سبقها من معارك تحرير مناطق سورية أخرى على أهميتها، فإن معسكر العدوان على سورية يلقي بثقله الآن في المواجهة مستبيحاً كل المحرمات من اجل منع سورية من تحقيق الأهداف الوطنية الاستراتيجية من هذه العملية. توجه مدمرة اميركية مع قطعة بحرية أخرى الى الخليج على متنها 45 صاروخ كروز لتجهز للاستعمال لقصف مناطق في سورية. نشر 3 قطع حربية من الاسطول الأميركي السادس مقابل الشاطئ السوري والتحضير لقصف في أهداف في سورية. نقل جبهة النصرة الإرهابية 8 حاويات من الكلور الى جسر الشغور لتكون جاهزة في تمثيل مسرحية استخدام الأسلحة الكيماوية واتهام الحكومة السورية به. انتشار عدد من فرق جماعات الخوذ البيضاء الإرهابية في مثلث ادلب سهل الغاب جسر الشغور تمهيداً للمشاركة في تمثيل وتلفيق مسرحية الكيماوي في مهمة «الإنقاذ» المزعوم والتوثيق المطلوب. تحذير فرنسي أميركي بريطاني منفرد وجماعي بالتدخل العسكري في سورية «إذا» استعملت الحكومة السورية الأسلحة الكيماوية. وكان التصريح الأخير لجون بولتون واضحاً بأن اميركا تحضر لعمل عسكري عنيف ضد سورية «إذا« استعملت السلاح الكيماوي. التهويل من قبل الأمم المتحدة وآخرين يدورون في الفلك الأميركي بوقوع كارثة إنسانية بين المدنيين إذا نفذت عملية تحرير ادلب عسكرياً. ويدّعي المهولون كذباً بأن في ادلب 3 ملايين شخص وهو رقم غير صحيح. ويناشدون القوى «المحبة للسلام» لمنع العمل العسكري في المنطقة لحماية المدنيين هؤلاء. التدخل العدواني الفظ لمنع أي نوع من المصالحات تجريه بعض الفصائل المسلحة مع الدولة السورية، كما وقمع الشرائح الشعبية التي تعمل للعودة الى حضن الدولة والوطن. السيناريو الأول: شنّ الحرب نفسية الصاخبة لمنع العملية. قد يكتفي معسكر العدوان بالإعلان عن المواقف السياسية والتحضيرات والاستعداد الميدانية العسكرية لاتخاذها عوامل ضغط على الحكومة السورية للتراجع عن عملية تحرير ادلب وفقاً لاستراتيجيتها المركبة من عمل تصالحي وعمل ميداني. وهو يعول على الحرب النفسية هذه من أجل الحؤول دون تنفيذ التحرير لإبقاء ورقة ادلب مع تضخيم وزنها وأهميتها، بيد القوى المناهضة للدولة لاستعمالها في البحث في الحل سياسي المرتقب. السيناريو الثاني: ارتكاب جريمة استعمال الأسلحة الكيماوية ضد المدنيين في ادلب واتهام الجيش العربي السوري بها والمبادرة الى تنفيذ التهديدات الغربية السابقة بقصف تحشيدات الجيش والحلفاء مع تحييد المواقع الروسية على ان تكون الضربة ذات وظيفتين رئيستين، وظيفة تحذيرية إنذارية تتوخى منها أميركا والغرب إظهار الجدية في المواجهة العسكرية إذا استمرت سورية في قرارها بالعمل على تحرير ادلب ميدانياً، ووظيفة عسكرية لتدمير بعض القطعات والتشكيلات التي حشدتها سورية للانطلاق في معركة ادلب ما يؤثر على انطلاقها ويعرقله ويؤخر ساعة الصفر. السيناريو الثالث: يبدأ كالثاني ولكن يتقدّم عليه بحيث ان المجموعات الإرهابية البالغ حجمها ما يصل الى 65 ألف مسلح، وبتخطيط وتنسيق مع قوى العدوان، تستفيد من الضربة العسكرية التي يشنها العدوان ضد الجيش العربي السوري والحلفاء وتنفذ هجوماً واسعاً باتجاه حماه وحلب. وهنا تستفيد تركيا من الوضع الميداني المستجدّ وتظن هي والقوى الأخرى بأنهم قادرون على تحقيق شيء من توازن في الميدان يمكنهم من كسب مواقع متقدمة في الحل السياسي بصيغة جنيف الأولى. السيناريو الربع: انتظار العدوان لانطلاق عملية التحرير وتقدير الموقف وفقاً لأيامها الأولى، مع تقديم الدعم غير المنظور للمجموعات الإرهابية، فإذا تبين للعدوان قدرة الإرهاب على الصمود بوجه سورية استفادت منه للقول بوجود التوازن الذي يحيي مواقعها في الحل السياسي الذي تريد، وإذا انهارت هذه المجموعات الإرهابية، تقوم قوى العدوان سريعاً بلعب مسرحية الكيماوي ثم التدخل عسكرياً على أحد مستويين: الأول منخفض الشدة والتأثير ويكون من قبيل تنفيذ التهديد والإيذاء دون أن يحقق وقفاً للعملية ويترجم بقصف أهداف مختارة بعناية. والثاني عالي التأثير والشدة ويكون أوسع وأشمل ويستهدف التشكيلات العسكرية المشاركة بالعملية ويرمي الى منعها من متابعة التقدم. على ضوء ما يمكن للعدوان القيام به، يبدو أن سورية وحلفاءها ماضون قدماً في العمل لتنفيذ القرار الاستراتيجي الكبير الذي أعلنه بنفسه الرئيس الأسد لجهة تحرير ادلب ومنطقتها وهم مع مراقبتهم ما يحضره معسكر العدوان من تحشيد وتلفيق ويمارسه من حرب نفسية، ماضون قدماً أيضاً في التحشيد والتحضير للانطلاق في عملية التحرير، وكما أن في أحد السيناريوات حرباً نفسية فإن معسكر الدفاع لا يفوّت فرصة هذه الحرب، ويدخل فيها باحتراف عالي كما يظهر حتى الآن. وفي هذا الإطار يسجل ما تقوم به الأجهزة المختصة في سورية وروسيا خاصة من فضح ما يخطط وما يحضر له معسكر العدوان والتحذير من مغبة الحماقات التي قد يرتكبها. أما الرد العسكري والميداني على العمل المسرحي والتحشيد القتالي فإن له عند معسكر الدفاع من الردود والمواجهة التي تبقى خططها أوراقاً مستورة لا تظهر إلا وقت الاستعمال حتى لا تفقد عنصر المفاجأة. إن ما يحيط بإدلب وما يحتمل من مواجهة بين معسكري العدوان والدفاع عن سورية هو جدي وهام نظراً لخطورة ملف ادلب وتداعياته على مجمل نتائج الحرب العدوان على سورية. وليس بإمكان معسكر الدفاع أن يتراجع. اما معسكر العدوان فعليه أن يعرف أن من صمد وانتصر طيلة ما يزيد عن 90 شهراً بإمكانه ان يخوض معارك قاسية لتثبيت إنجازاته حتى ولو تطلّب ذلك تسعين يوماً أو تسعين أسبوعاً إضافياً من القتال، وهو لن يتراخى ولن يضيّع مكتسباته وأن معظم ما في المشهد الميداني يشهد لصالح انتصار سورية وحلفائها.